Born in a progressive landlord family in Siliguri in 1918, he not only dedicated his entire life to peasants' cause but also authored the historic 1968 Naxalbari uprising, the ideology that guides the red radicals even today. Son of an active freedom fighter, Charu Majumdar or CM rebelled against social inequalities even as a teenager. Later, impressed by "petty-bourgeois" national revolutionaries, he joined All Bengal Students Association affiliated to Anusilan group.Dropping out of college in 1937-38 he joined the Congress party and devoted himself in organising bidi workers. He later crossed over to CPI to work in its peasant front and soon won respect of the poor and downtrodden of Jalpaiguri and Darjeeling. Soon an arrest-warrant forced him to go underground for the first time as a Left activist. 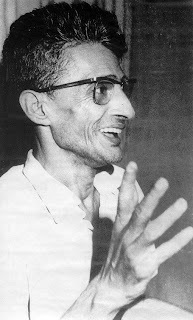 Although the CPI was banned at the outbreak of the World War II, he continued his organizing activities among peasants and was elected to the CPI Jalpaiguri district committee in 1942.The promotion emboldened him to organise a 'seizure of crops' campaign in Jalpaiguri during the Great Famine of 1943, more or less successfully. In 1946, he joined the famous Tebhaga movement and embarked on a militant struggle in North Bengal. The stir shaped his vision of a revolutionary struggle. Later he worked among tea garden workers in Darjeeling.For taking the road of the intertwined revolution, the CPI was banned in 1948 and CM was put behind the bars for next three years. He tied the nuptial knot with a fellow CPI member from Jalpaiguri - Lila Majumdar Sengupta in January 1954. CM's growing ideological rift with the CPI came to fore after the party's Palghat Congress in 1956. The 'Great Debate' across the communist world in the late 50s propelled him to mull a revolutionary philosophy suiting Indian conditions.He was again jailed during 1962 for criticising the Nehuru Government’s notorious attempt of Chinese expansion. The CPI split in 1964 over ideological differences among the cadres. Charu Majumdar joined the breakaway part, the CPI (M), but could not go with its decision to participate in polls by postponing 'armed struggle' to a day when revolutionary situation prevailed in India. He kept a bad health during 1964-65 and was advised rest. But he devoted this time, even in jail, to study and write about the path of the Indian revolution on the basis of Marxism-Leninism-Mao Tse-tung Thought. The exercise shaped his vision and ideas of a mass struggle, which were recorded in his writing and speeches of 1965-67. These were later called 'Historic Eight Documents' and subsequently formed the basis of Indian Communist Movement or Naxalism. The CPM formed a coalition United Front government with Bangla Congress in West Bengal in 1967 by betraying the cause of revolution.On May 25 the same year, the CM-led "rebels" launched the historic peasant uprising at Naxalbari in Darjeeling district of West Bengal. The rebels annihilated the notorious police inspector – Sonam Wangdi, and created the foundation of India’s New Democratic Revolution. The state government’s Home Ministry headed by the CPI (M) leader Jyoti Basu brutally suppressed this movement by killing 11 women and 2 children. But the ideology of "naxalism" not only survived but also spread in different corners of the subcontinent. With the upsurge of naxalism, comrades from Tamil Nadu, Kerala, UP, Bihar, Karnataka, Orissa and West Bengal set up All India Coordination Committee of Revolutionaries (AICCR) in CPI (M) on Nov 12-13, 1967. It was renamed as All India Coordination Committee of Communist Revolutionaries, which launched CPI (ML) on April 2, 1969 with Charu Majumdar as its General Secretary. In 1970, the CPI (ML) organised its first party congress in Calcutta in strict underground conditions. CM was re-elected as the General Secretary. The Party Congress put forward the programme of protracted people’s war advocated the battle of annihilation of class enemies. Authorities mounted a fierce crackdown on Leftist movement across the country, particularly in West Bengal and Andhra Pradesh, which climaxed during and after 1971 Bangladesh war with the killings of many key Naxalist leaders. By 1971, Comrade Charu Majumdar and Comrade Saroj Dutta became India's most wanted men. In the early hours of 5th August, 1971, comrade Saroj Dutta was brutally murdered by the police at the Aryan Club ground. As per the CPI (ML) records, Charu Majumdar was arrested from a Calcutta hideout on July 16, 1972, due to the betrayal of the then PCS of CPI (ML), Bengal Unit, Dipak Biswas. During his ten days in police custody in Lal Bazar lock-up no one was allowed to see him -- not even his lawyer, family members or a doctor. The Lal Bazar lock-up had achieved a reputation throughout the country for the most horrifying and cruel tortures. He died at 4 am on July 28, 1972 in the same lock-up. Even the dead body was not given to his family. Police, accompanied with immediate family members carried the body to crematorium... The whole area was cordoned off and no other relatives were allowed in as his body was consigned to flames. Death of CM closed a vigorous chapter of Indian "revolutionary movement".